By no means am I wuss, a princess, or a diva; I have no problems getting my hands dirty and sweating. However, I’m not a tomboy and I’m not into the outdoors. I’ve never camped, hiked or whatever it is people think is fun to do in the woods—I dropped out of the Girl Scouts after one week and I avoid sitting outside for brunch in the summer when it’s too hot. I abhor humidity and can’t sleep if I know there’s a mosquito flying around in my apartment. All that being said, I also like pushing my body to its limits, getting stronger and working out in any way that will get me my desired results; I want to be a physical beast (while still looking feminine). I want to know that if I have to run for my life, that if I have to scale walls or do whatever it takes to stay alive in a dire situation, my chances of survival are as high as possible. So when a fellow worker-outer started mentioning the Reebok Spartan Race I initially balked, but as everyone else signed up and grew increasingly excited, my boyfriend and I seriously began to consider it as well. And being the impulsive person that I am, I signed us both up two days before the event…then inwardly cringed. Not only did I feel physically unprepared and incapable, I didn’t even know how I could be mentally prepared for something as daunting as 4.5 miles of rocky hills and 15 grueling obstacles interspersed along the trail. Let’s just say I felt numb for those two days leading up to the race. 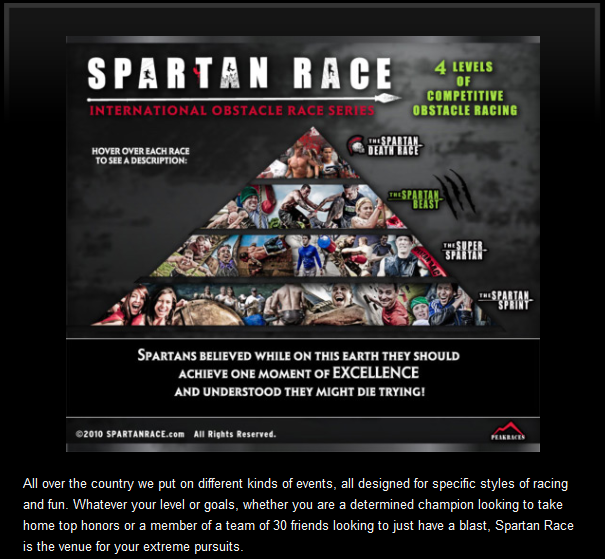 · Different distances for different levels and styles or racing. Our team ran the Spartan Sprint. After my initial shock of pressing “JOIN” wore off, I immediately started my own recon to find out everything I could about the course and how to prepare. The race is different every year, however I needed to see what kind of obstacles were probable so as not to go into this completely blind. The videos of races past, accounts from those who’ve participated in years prior, and pictures of men and women scratched up, tired and battered, had me at a total loss. Yet even all of that couldn’t prepare me for the actual experience of hurdles like scaling walls, rope climbs, barbed wire crawls over rocks, log, boulder and sandbag carries, monkey bars and nets, rock climbing, and jumping over fire. Hell, we had to scale a wall just to get to the starting line! I was ready to turn around and go back home as soon as I saw that craziness. Conversely, my mind completely changed when I saw one of the morbidly obese, out of shape contestants from NBC’s television show, The Biggest Loser, heave herself up and over that first wall: NO EXCUSES, BEAST MODE, FINISH THIS. There was no going back and I knew I had to test myself, body and mind. No more mental blocks were allowed to reside in my brain. If the man with one arm that was smiling a few feet away from me could do it, if the TV contestant could do it, then I could do it, too. I used to be that woman. Thank the gods on Mount Olympus that I stuck with it! While it felt like hell on earth at certain points (the barbed wire crawl was a big one), it was insanely awesome at the same time! Reebok has some smart people in their company; they design and engineer these races flawlessly. The courses truly show you what you’re made of in every aspect of human nature: fear, competitiveness, determination, strategy and ambition; physical and mental prowess, strength, capability and overall confidence. I regret nothing about joining this race. Self-doubt, fear of failure, and thoughts of defeat are now out of the proverbial window. Right now as I type this post, the feeling of accomplishment is almost overwhelming. 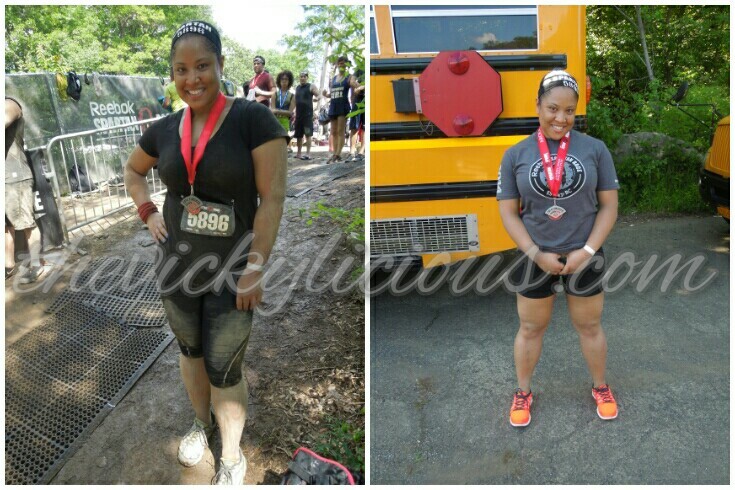 From being morbidly obese at 230 lbs with no muscle strength; from not being about to run one city block without losing my breath; from having joint pain because I couldn’t carry my own weight; I made it to the Tri-State Spartan Race in Tuxedo, NY on Saturday, June 7th, 2014. Every ache, scratch and bruise makes me smile and my eyes well with tears unshed. I went into this experience thinking this would be a bucket list item, but I already know this has now become an annual test for me—I’m hooked. Even my workouts will be geared toward preparation for future races. I am determined, I am focused, I am a finisher. I am a Spartan. PS: Yes, I sure did give myself a fresh manicure when I got home. You bet I did! This entry was posted in Bodybuilding, Diet, Exercise, Fitness, Health, Health & Beauty, Lifestyle, New York, Nutrition, Review, Workout and tagged bodybuilding, capability, cardio, conditioning, exercise, fat-loss, fitness, goals, health, inspiration, lifestyle, muscles, New York, obstacle, race, Reebok, review, Spartan Race, strength, training, weight loss by The Vickylicious. Bookmark the permalink.